September 22, 2012 by Alphageek in "alphageek", "discovery"
This article was inspired by a podcast I was listening to. The podcast is called simply The Sporkful and is usually about some sort of debate about the best way to enjoy food. Most of the time I listen and perhaps voice an opinion or two to Mrs. alphageek while we are driving somewhere or other. However, this episode of the Sporkful got me fired up. Yes, it got me fired up enough to write a rebuttal. What could get the alphageek going? The Banana Split, pure and simple. This particular podcast is about bananas, and is entertaining, as is everything on the podcast. The podcast was going along nicely, when all of the sudden, the banana split was vigorously attacked. I simply cannot let this attack go without simply saying: banana splits are great. One point was that the banana was not front and center. I say, where are you getting those banana splits? Here is one I got recently, and the banana was clearly a star, and easily located. This location allowed the banana to be enjoyed with every bite of ice cream, until the end. The alphageek says great eating. The other point was one should cut up the banana and simply sprinkle the chunks upon an ice cream treat. This is simply a bad idea because the banana will turn brown if cut up before hand, and if cut fresh, there are too many cuts to make a banana split quickly. The banana split below requires one cut to prepare. This technique allows for quick preparation rather than wasting time cutting up a soft fruit that is easily enjoyed with a spoon. 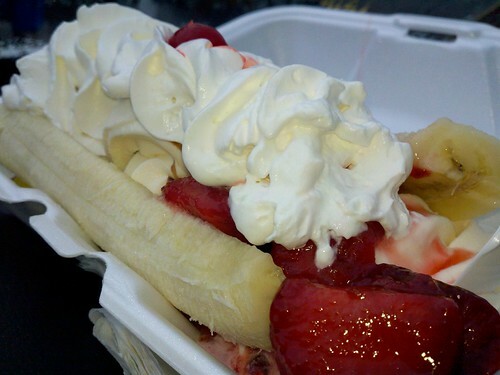 Go out and enjoy a great banana split today, and defend the treat today.